Transport Situated in the heart of the West End, The President is in a prime central London location for tourists, business and families. Direct connections to Heathrow Airport are available via the nearby Russell Square Underground Station and the Heathrow Airbus stops in the hotel courtyard. Description The President is a modern hotel, offering traditional values and service. Comfortable and relaxing, its facilities include bar and restaurant. Guests also enjoy the tranquil Atrium lounge and peaceful Atrium Coffee-Bar for an a la carte lunch. 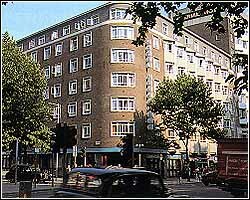 Those staying in the President can use the facilities of the adjacent Imperial, including Night & Day Pub-Bar. The hotels share a shopping arcade with hair salon,and newsagents. Swimming pool and health club facilities available close by. We highly recommend this modern 3 star hotel. A favourite of tourists for many years. Well located in the centre of London and competitively priced including a full cooked buffet breakfast.